This time, we stop for a while before the E-F-V & Friends Trunkshow with The Concrete, a Spanish menswear brand that has its own unique approach to tailoring. Combing the durable fabrics and rugged styles to classic tailoring, The Concrete has created its unique style that bridges the gap between formal wear and relaxed casual wear, making it very suitable to dress both up and down. If you find rock and roll inspired styles interesting, give The Concrete a good look. – You call your approach as “rugged tailoring”. Could you describe the idea behind rugged tailoring and why did you decide to pursue it? The idea behind rugged tailoring is to make (or have, depending on where you stand, whether maker or customer) bespoke clothes that are both elegant and comfortable. Clothes you can use to go to work, and that will last longer than anything else you would wear. It’s a mix between the historical work wear and tailored elegance. It’s both rugged and tailoring. Hence the association of those two ideas I coined when I began making that type of clothes. – Of course, there are “icons of denim” in the past, like the famous dinner suit Levi’s made for Bing Crosby. Does your inspiration come more from these icons or from the other areas of menswear? When I began wondering about making clothes, I wanted to make t-shirts mainly. I come from skateboard, so the idea was making clothes that me and my friends could wear skating. Then I explored a bit more and I wanted to make hoodies. Then, I decided the clothes I would make would be 100% ethical, I even went to Peru to make sure to get the best cotton. Then the crisis came and I had to twist everything, I had to approach things from a different angle. I decided it was time to make a luxury product, something less “fast fashion”. So I met a tailor, I asked him to train me to become a tailor myself. And once that was done, I decided to break the rules of this training and take it back to my level, to the roots I come from. I thought “I want to make a pair of trousers that are both bespoke and that I can wear during my skateboarding”. Only then did I begin to explore denim more profoundly. I discovered a world that was both completely unknown and unexpected. – Who would you say is your ideal customer? There is no right answer to this question. I mean, I could style a rock star and it would be amazing to do so, but I like to think that my style can go to any guy (and girl!) that wants to wear something he/she feels confident in. Tailoring has been for a long time an elitist pleasure because it is an expensive one. But right now we see people coming to tailoring that never ever would have come 15, 10 or even 5 years ago… Mentality are changing so really it’s about two things: what fabric do you want to wear – I don’t only work with denim even if it is my main activity – and what aspect do you want to have? Some people want a very uncommon fabric with a very formal cut, others come to me because they like how informal I can be in my designs but want very formal fabrics, I guess I could say a more “noble” fabric – even if, as you surely know, some denims are very noble. So as I said, there is no “ideal” customer, only what the customer wants from me, and what I can offer. – From what I see, your tailoring would naturally blend into the rock and roll lifestyle. Would you say that is one of your “target groups”? – The styles that are presented on your website show tailored styles in a bit surprising habitat – with motorcycles. Has the chosen fabric been the inspiration here or did you want to design something especially for motorcycling? A personal hobby, perhaps? I am I must confess a true motorcycling fan. I bought a few months ago a sportster from Harley Davidson and I followed way before that some guys on Instagram: @elsolitario. Those guys do the most incredible work with motorcycle and I’ve been a fan of theirs for some time now. So I wrote to them and they wrote back to me and decided we would do a little something together. We designed a jacket especially for motorcycling and they helped me with the visual merchandising of my first ready to wear capsule collection I sold in Santa Eulalia, a big concept store in Barcelona. This is a little part of what I do really, but my intention on my website is to reflect who I am. – Of course, people seldom associate denim with high tailoring. How has the reception been? I can’t complain really! Up until now, people have been very curious and interested in my work. It tells a lot about this industry and the actors in it. Of course I imagine that some might be surprised and not very keen on it, but really my feeling is that most of the time they just want to know how I do it and how did I decided to do it. – Does the process follow the bespoke “routine” with fittings? How long does it take from taking the measurements to a complete product? I’m not sure I should say that as this industry is quite secretive, but I work fast. I take measures, I make it for the first fitting. Some of my customers are happy after the first fitting. If I have to change and/or modify things, I do it without any problem. I’d say in total I need something like 40 hours for a suit. – Where do you make the products? It’s changing a lot lately, but I’m quite the nomad (laughs). I’ve been producing in Madrid in a little workshop next to my store for 4 years. Then I moved the workshop to Zaragoza and decided I would come regularly to Madrid, taking only customers through appointments. Then I moved back to Madrid and now I’ll be in Mallorca for the summer, producing there. I feel very inspired by the mediterranean sea lately, and the vibe there is there on the island is not something you can find in Madrid. – You have done some collaborations with Valtoron and El Solitario Motor Co., for example. What kind of qualities do you wish from collaboration partners? Both those collaborations came naturally and I’d say that’s one of the conditions. Then, the lifestyle that both those brands show is very similar to the one I want to show, so of course that helps. You will never see me working with a brand or an artist that hasn’t got any interest in common with me. It has to be organic in a way, I have to “click” with the people behind the brands I work with. – What are your aims for the future? My goal is to be able to make more bespoke clothes on one hand. I want to take The Concrete to different places in the world, I want to travel with the rugged tailoring all around and make people know about what I’m doing here in Spain. On the other hand I’d like to develop my own ready-to-wear collection, for men and women. First humbly, with few garments, and then maybe one day, with a full collection, twice a year. But above all that, I mostly want to be continue being happy with what I do, both personally of course and then professionally. By that, I mean doing things the way I want to do them, respectfully and without having to renounce my values. Come and visit The Concrete in E-F-V & Friends Trunkshow 26.-27.5.2017! E-F-V and Friends would like to present a Swedish accessory brand called Dreaming of Monday, which, remarkably, manufactures all their goods in Sweden instead of outsourcing the work abroad. As this approach is growing rare these days, we decided to have a brief conversation with them regarding their new, incoming product line and other news they might have. – What is Dreaming of Monday all about? What sets you apart from other brands? Dreaming of Monday makes premium accessories handmade in Sweden, which are made with the outmost attention to details and with a design-approch that we like to call Everyday Elegance. Everyday Elegance is all about contradiction, about seeing things differently and to make products that appeals to everyone. For example, our ties are made without any interlining, instead we use one single piece of fabric that is folded several times to create the proper weight, resulting in less formal product with a superior drape and a lighter feel. By adding informal aspects to a formal product such as the tie, makes for an interesting contradiction, which ultimately is the essence of everyday elegance. – What are the central values of Dreaming of Monday? To make handmade products with the highest level of quality and craftmanship. – Your products are made in Sweden. Will you stay a strictly Swedish manufactured brand even if the popularity would force you to expand? Absolutely! For us ”Handmade in Sweden” is not only a marketing tool, instead it´s a deliberate strategy both in terms of practical and economical reasons. First of all, in order to uptain the high level of quality in all our products it’s important to have all production in-house and therefore also have it locally. Secondly, a integrated value chain, from production to retail, allows us to offer a higher level of quality to a much lower price than normal. In summary, we can offer a better product by making all our products by hand in Sweden. – Accessories are highly specialized products. Do you make them all yourself? How did you learn the trade? All products are handmade in our atelier located outside Malmö, in the southern part of Sweden. Our in-house artisans are educated in pattern construction and have over a decade of experience in sewing by hand. – Where are the materials sourced from? Is there Swedish raw materials among them and, if not, are you planning to use them in the future? All our fabrics comes from renowned manufactures based in Italy and England. We would love to use locally produced fabrics aswell but unfortunately there are no companies left in Sweden that makes wool and silk fabrics, which we use for our accessories. – Collaborations are a big part of smaller brands nowadays. Have you done any and are you interested about, for example, producing an accessory line to complement a collection of a clothing brand? We are always interested in collaborating with others, both brands, bloggers and designers. Right now, we are actually working with a couple of local designers and hopefully we will launch something together soon. Also, we are very keen on retail collaborations like the trunkshow we are doing togheter with you guys at EFV. It is perfect for smaller brand and companies to work together to form an interesting mix, which can make people more aware of new brands out there and also enhance their interest in general. – We’ve seen from the social media that you are about to release a new collection and website. Would there be anything you want to tell about your new 2017 collection? Any interesting behind-the-scenes facts? First of all, we are so excited of our new website! It will be a total makeover and a upgrade from our last website. We have created a platform which we think better reflect the premium accessories we create. Regarding our collection, Dreaming of Monday is not a brand that mainly focus on the different seasons. Instead we try to create a collection that can be used at any time and at any occasion. We see our collection more as a library, where we collect great styles that we keep as staples and combine these with regular, new additions that compliment the others. Our ambition is to create a platform for premium accessories, a platform filled with products made for everyone. – What are the future plans of Dreaming of Monday? With our new website we have created a great, longlasting platform from which we can shape the future of our brand. One of the new features on the website is our journal, where we will tell more about the fantastic world of Dreaming of Monday. Here the readers can learn more about the craftmanship that is put into each product, what inspires us, how you take care of your accessories and much more. We plan to reguarly update the journal with interesting new material. In the coming weeks and months, we will also introduce a new product, which can be decribes as a combination of a scarf and a tie. We have named it the Casual Cravatte. In addition to a new product category we will also introduce a bespoke service, where the customer can, not only change the length and width of the tie, but also the construction and details on the tie, like how high you want the bar-tack to be placed or if you want a bigger or smaller knot than standard. We plan to continue with having trunkshow in differnt locations in order to create the opportunity for people to see and experience our products live. This also creates the opportunity to interact with customers and hear their thoughts about what they like to see in the future. Last but not least, we plan to open a local showroom in Malmö, where anyone can visit and see not only the finished products but also the production process, the complex process of making a premium accessory handmade in Sweden. Our thanks to Dreaming of Monday for taking time to answer our questions! You can meet them in E-F-V & Friends Trunkshow – welcome! Myrqvist, the fresh Swedish shoe brand, is our first visitor for the E-F-V & Friends Trunkshows. We sat down with them for a few questions about their products and views. You can find Myrqvist products from their online store at www.herrstil.com or visiting selected trunkshows. Myrqvist is a Swedish Footwear Brand created by us at Herrstil in conjunction with our successful Kickstarter-campaign last year. Our philosophy is to offer high quality shoes for a reasonable price, which we have achieved by cutting out the middle men and sell directly to customers online. – Where and when did the idea for Myrqvist come? After a few years of solely selling shoe care products, we had accrued knowledge about the Swedish market for high quality shoes and creating our own line of Goodyear Welted shoes felt like a natural next step for us. Until Myrqvist there was no Swedish shoe brand producing traditional Goodyear welted footwear. We believe there is a demand for high quality shoes tailored for a Swedish market, with respect to weather conditions, price-point and aesthetics. – Where are the products made? Our shoes are produced in Vellore, which is known as the leather capital of India. The town has a long history of leather production. During the time of British rule, Vellore initially became a center of saddle making for the army, and with time started producing other leather products including footwear. Today it is one of the greatest leather exporters in the world. – Where do you source the raw materials? The raw hides are imported from around the world, but locally developed by family owned tannery. For example, we are currently producing shoes with a calf skin from France. The tanned hides are then selectively cut in the factory, where only use first grade pieces for the uppers. – How do you ensure both the product quality and the manufacturing ethics of the outsourced production? By regularly visiting the factory, we have ensured that the quality of the shoes is at its finest and the working conditions for the employees are at a western standard. – What kind of shoe models shall we see in the immediate future? We have an upcoming collection including a double monk strap and different loafers… Stay tuned! – What are the future plans? Shall Myrqvist head to international market? Being a part of the international market is definitely a plan for the future. However, our main focus now is the Swedish market, but anyone can order from anywhere in the world online. – Do you see your brand doing collaborations – both shoe model- and business wise – with other companies? Of course! We are very open to the idea of developing a shoe model together with either an individual or business, as long as we share a similar philosophy for quality and design. Business collaboration like the one we have with E-F-V is also a great way of reaching a larger audience for both parties. We are looking forward to more Collaborations like this in the future. The First official E-F-V & Friends Trunkshow will take place on Saturday, 25.3.2017! Myrqvist, the Swedish shoe brand, are joining us with their awesome shoes in the E-F-V Showroom, St:Eriksgatan 79. Myrqvist will also bring some sample shoes with them, so here is a possibility to grab a nice pair for a very friendly price! You will also have the possibility to get measured for an E-F-V shirt by Jussi Häkkinen our master measurer, will come over to Stockholm. We have a wide selection of fabrics, naturally from the best manufacturers, to choose from – as well as collars, cuffs and other details. E-F-V´s Ready-to-Wear collection is also available in a few sizes. And something to sip while browsing the goods is at hand! If your Saturday is already booked, you can reserve a time for shirt measurement for Thursday and Friday as well. Myrqvist will also be present on Friday from 15:00 to 17:00. A warm welcome / E-F-V & Friends! Ready-to-wear garments are often “good enough”. However, should you be a more discerning customer, have unusual proportions or just wish to try a more personal fabric, Made-to-Measure makers step in. Be it asymmetrical shoulders, long arms or some other similar fit issues, or simply the wish for a better fitting garment a knowledgeable Made-to-Measure expert shall address this with precision. Naturally, even if the ready-to-wear garment – a shirt, for example – fits you well, there definitely are certain points that can be improved. The ready-to-wear shirts and suits tend to have some aspects that deviate from the plain average. For example, armholes and waist measurements tend to be be larger than usually needed to accommodate the widest possible amount of personal proportions. For the same reason, cuffs and shoulder widths are almost always rather excessive. All these issues are easily corrected in a Made-to-Measure process. Having something made specially for you has other benefits, that just choosing a garment off the peck cant adress. For example, your stylistic visions on fabric, colours, collar/cuff shape and whether to add a personalization in the form of a monogram or not. With a skilled clothier, the fruitful conversation is also a part of the process. The professional can ensure that the creation is both tasteful and to your liking. 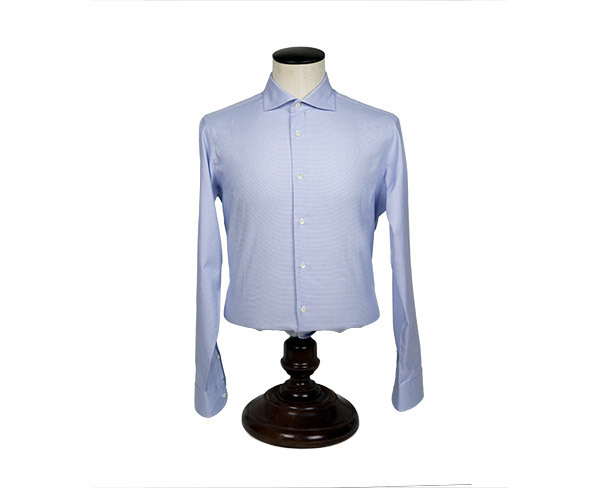 Even if you only have a hunch about the idea you wish for, the knowledgeable professional can distill it into a complete product that has the fabric, fit and style that suits you and the occasion you wish to wear the shirt for. 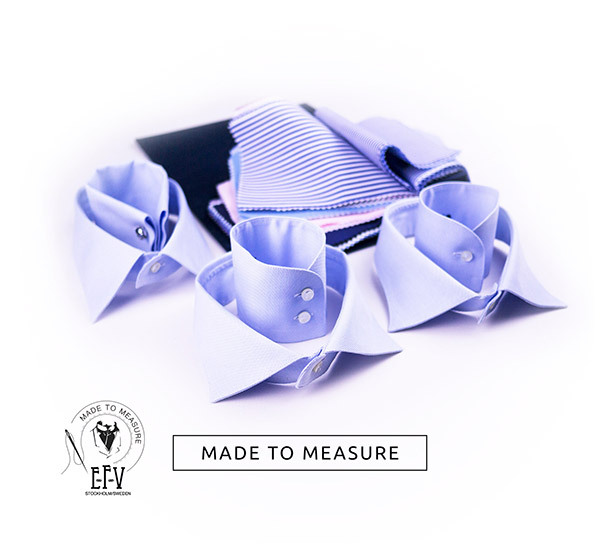 E-F-V offers Made-to-Measure shirts that are measured by a seasoned professional, made from a wide selection of fabrics that are manufactured by the finest European mills and finally sewn carefully to your exact measurements. As a result, the fit, durability and look fill the requirements of even the most demanding customer. The E-F-V Made-to-Measure shirt service is available at E-F-V & Friends Trunkshows, in our showroom by request and on location for groups by appointment.